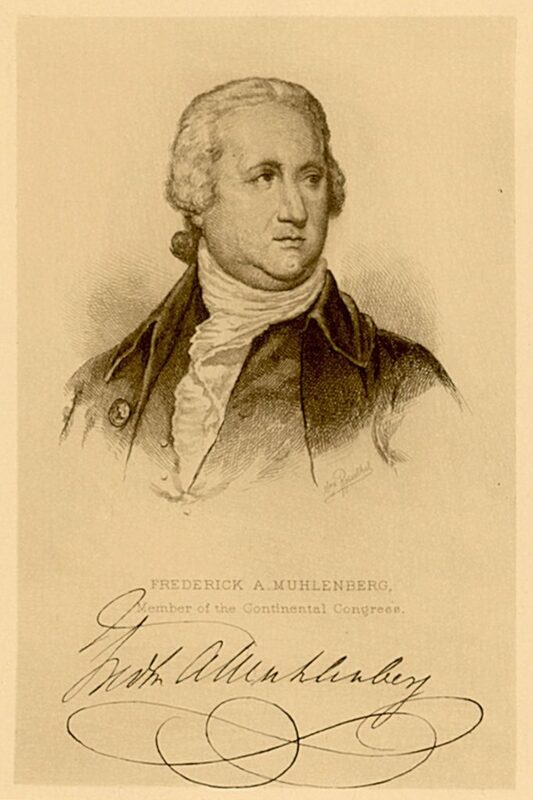 Frederick Augustus Conrad Muhlenberg, a native of Trappe, Pennsylvania, was the son of Henry Melchior Muhlenberg, a prominent Lutheran minister, and his wife, Anna Maria Weiser. At the age of thirteen Frederick was sent with his brothers (one of whom was Penn trustee John Peter Gabriel Muhlenberg) to be educated in Germany. In 1770, after studying at the University of Halle, he returned to America and was ordained as a Lutheran minister. The next year he married Catharine Schaefer, the daughter of a Philadelphia sugar refiner; they would have seven children. Young Muhlenberg worked as a clergyman on a rural Pennsylvania circuit until 1773, when he accepted a call to the German-speaking Swamp Church (Christ Church) in New York City. A supporter of the patriotic movement, Muhlenberg left New York City for Philadelphia when the British occupation became imminent in 1776. In Philadelphia, he preached at various places, but quit the ministry in 1780 to engage in politics and to support his family through business pursuits. His unsolicited 1779 nomination as a delegate (replacing the recently deceased Edward Biddle) to the Continental Congress began a long and successful career in state and national politics. He served on the Continental Congress until 1780. Enjoying the confidence and support of the German community in the Philadelphia area, Muhlenberg was first elected to the Pennsylvania Assembly in 1779 on the radical (constitutional) ticket. He was quickly chosen as Speaker of the Assembly. During the 1780’s he also held a variety of local offices in Montgomery County. During this period, he became more moderate and encouraged the revision of both Pennsylvania’s unicameral constitution and the national Articles of Confederation. In 1787 he was president of the Pennsylvania Convention to ratify the new federal constitution. He also helped to encourage ratification through his contributions to German-language publications. Under the new constitution, he was elected as a Federalist to the first four United States Congresses, serving as the first Speaker of the House of Representatives. When the federal capital moved from New York to Philadelphia, Muhlenberg made his home an important social center for members of Congress. During the 1790s Muhlenberg was twice the unsuccessful Federalist candidate for Pennsylvania governor. His opposition to the Jay Treaty in 1796 led to defeat of his bid for another Congressional term. In 1800 Governor McKean appointed him collector general of the Pennsylvania land office; the following year Muhlenberg died in Lancaster, then the seat of the commonwealth government. His biggest political achievements were the building of bridges between Federalists and Democrat-Republicans and his role in the integration of German Americans into the American political process. It was during his tenure as Speaker of the Pennsylvania Assembly, from 1780 to 1783, that Muhlenberg served as an ex officio trustee of the University of the State of Pennsylvania (now the University of Pennsylvania). His other years as a trustee were in an elected capacity.